Cannabis has been used as medicine for thousands of years. Among all of the modern world's medications, it still stands strong as a thoroughly studied herbal medicine shown to be effective at easing the ails of old age. Aging, the process of growing older, is an inevitable part of the human experience that is dictated both genetically and environmentally. Although the phenomena of aging may grace us with life experience, wisdom and humility, it is also accompanied by the certain decline of our physiology. Bodily functions start to deteriorate, cognitive function may become impaired and we begin to lose certain advantageous aspects of our youth such as flexibility, sensory accuracy and lung capacity. Aging is something we must accept, however the rate at which we age and the quality of aging are factors that we can control to a degree. Nutritious food, appropriate exercise and movement, the right types of medicine and constant mental stimulation and learning can all trigger our biology epigenetically to ensure the longest and healthiest life span possible. There exists a stereotype in the Western World that links aging and elderly people to constant pain, disease and large enough amounts of pharmaceutical medication to fill out a pill box labelled for every day of the week. The sad reality is that many of the medications our elders receive are highly addictive and potentially dangerous opioids. Not only are prescription drugs in this category responsible for tens of thousands of fatalities annually, they are rather two dimensional in mechanism of action. There is an incredibly potent and scientifically validated plant medicine that can enable seniors to bypass or at the very least minimize their consumption of pharmaceutical medicines: Cannabis. Although marijuana is still suspended in the realms of taboo by many, scientific analysis is displaying it is capable at treating certain ailments and curing others. Many of these ills manifest during old age, after decades of nutritional deficiencies, exposure to all manners of pollution, genetic dispositions and a host of environmental factors. However cannabis has been shown to be beneficial to those enduring these conditions and for these reasons it is a perfect herbal ally for those navigating the crucible of old age and disease. Cannabis is so effective as a medicine because it interacts with the human body in a very specific way. Within our bodies exists what is known as the endocannabinoid system, made up of receptor sites present throughout much of the body: organics, glands, the immune system. This system is fundamentally involved in maintaining human health by nudging the body into a state of homeostasis, or balance. These receptor sites are activated by certain internal or endogenous cannabinoids, such as anandamide which is chemically similar to THC. However, external cannabinoids, known as phytocannabinoids, such as THC and CBD, also activate these receptors. So, exactly what conditions can this super herb mitigate? And how does it work to do so? Let us take a glance. There are two predominant forms of this unfortunate condition. Osteoarthritis usually develops in adults in their late 40s. It affects the lining of the joints, resulting in cartilage loss, bone rubbing on bone and joint disfiguration. On the other hand, rheumatoid arthritis manifests when the immune system starts to target joints within the body which in turn causes pain and swelling to erupt in these areas, eventually leading to cartilage and bone destruction. A paper published in the journal Rheumatology has confirmed that CB2 receptors, along with CB1 receptors, that make up the endocannabinoid system, are abundant in the joint tissue of arthritis patients. McDougall’s research has shown that cannabinoids attach themselves to nerve receptors within the joints. By doing so they manage to control the firing of nerves that perceive pain. Alzheimer’s is the most common catalyst of dementia, perhaps one of the the most devastating diseases urged on by age. The condition mainly affects people over the age of 65. The risk for Alzheimer’s is known to double every five years after this age. During the period of this disease, protein structures called plaques build up in the brain. This buildup results in the loss of connections between nerve cells in the brain, leading to the destruction of nerve cells and brain tissue. The symptoms of this disease are devastating. Those suffering may begin to experience signs of memory loss such as losing items, forgetting events and getting lost. Eventually this may develop into confusion, hallucinations, aggressive behavior and even the inability to eat and walk without assistance. Thankfully, cannabis is displaying promise in preventing this horrific disease, and even treating it. A study published in the Journal of Alzheimer’s Disease discovered that small doses of THC are capable of slowing the production of the proteins that eventually form plaque buildup in the brains of Alzheimer’s sufferers. More research is required before solid conclusions can be made, but this study alone suggests that marijuana consumption could be a key defence for the elderly in warding off this terrible condition. In terms of treating Alzheimer’s, another study published in The Journal of Alzheimer’s Disease found that THC is able to relieve the symptoms of the disease. The researchers stated that, “adding medical cannabis oil to Alzheimer’s patients’ pharmacotherapy is a safe and promising treatment option”. Although medical grade cannabinoid extracts pose a potent avenue of treatment, smoking itself appears to be useful in this context too. Professor of neuroscience at Ohio State, Gary Wenk, conducted a survey that concluded, “individuals who smoked marijuana in their ‘60s and ‘70s, who are now entering their 60s and 70s, are not getting Alzheimer's at the rate they should be”. Cancer is one of the most rampant diseases in the Western World and one of the leading causes of death. Cancer has no age restriction but primarily occurs in the elderly. It has recently been revealed that up to 90 percent of cancers are not actually down to genetic bad luck, but are manifestations of the environment. This means lifestyle choices are key, and marijuana may just be one of the best lifestyle choices a person can make in regards to cancer. Cancer is a touchy subject, and the current studies are by no means complete, but there is promise that cannabis can have positive effects on this disease. This is especially important considering that conventional treatments fail far more often than they succeed. The United States National Cancer Institute acknowledges that cannabis has been proven to kill cancer cells in the laboratory. The institute presents various studies in which cannabinoids have shown to destroy cancer cells and minimise cancer risk. These include cannabinoids minimising colon cancer risk due to anti-inflammatory effects, THC damaging and killing cancer liver cells and the anti-tumor effects of THC. Adding to this profound list is a paper published by the American Association for Cancer research that showed CBD to inflict programmed cell death in breast cancer cells. Perhaps more impressively, researchers at Madrid’s Complutense University found that THC can induce programmed cell death (known as apoptosis) in brain tumor cells without harming surrounding healthy cells. The same research team later discovered that synthetic THC eradicated brain tumors in the majority of tested rats, when injected. Pain is an issue that plagues many elderly people. Around 60-75 percent of over 65s are reported to have issues with frequent pain. Specific issues responsible for chronic pain are osteoarthritis, joint pain and musculoskeletal pain. Cannabis is a safe, natural herbal approach patients can take to ease their daily pain and improve the quality of their lives. A study carried out by researchers from McGill University, Canada, found that smoked marijuana from a pipe can dramatically reduce chronic pain in patients with damaged nerves. Cannabis for pain may very well help patients reduce opioid prescriptions, according to a University of Michigan study. Kevin Boehnke of the School of Public Health’s Department of Environmental Health Sciences has explained, “we would caution against rushing to change current clinical practice towards cannabis, but note that this study suggests that cannabis is an effective pain medication and agent to prevent opioid overuse”. Parkinson’s Disease is a chronic movement disorder that worsens over time, involving the malfunction and death of neurons in the brain. Primary signs of the disease include tremors, rigidity and postural instability. The vast majority of diagnosed cases occur in over 50s and incidence increases the older the individual. Cannabis conjures hope in this arena of medicine too. A paper published in the journal Clinical Neuropharmacology found significant improvements in both sleep and pain when smoked Cannabis was administered. The authors note that, “the study suggests that cannabis might have a place in the therapeutic armamentarium of Parkinson’s Disease". Depression is a well known mood disorder that can have devastating effects on a person's quality of life, productivity and creativity. Symptoms range from appetite and weight changes to self-loathing and reckless behavior. These are just a few of over 50 different symptoms. An individual is more likely to develop depression if they are between the ages of 45 and 64, so age is a factor. A study from McGill University found that a synthetic form of THC, a replica of the active psychoactive ingredient in cannabis, is an active anti-depressant at lower doses when administered to rats. It was found that low doses increased activity in neurons that produce serotonin, a neurotransmitter key to mood regulation. It is important to note that the researchers noticed that when the dose was increased it had the reverse effect and serotonin decreased. Chronic stress is a major cause of depression. Scientists at the University at Buffalo found that chronic stress decreased the production of endocannabinoids in animal models which resulted in depression-like behavior. Researchers suggest that using cannabinoids from cannabis could help to treat depression and stabilize mood. Although the science is relatively sparse at this point, it will become more dense and telling with time. 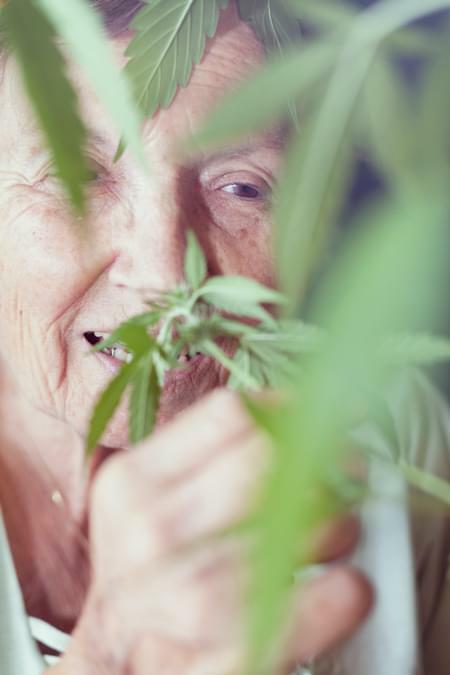 What we know now based on the research we do have access to is that marijuana offers the elderly an incredibly safe, non-toxic alternative to certain potentially harmful medications for a host of diseases that are linked to old age. Cannabis and the compounds within this plant have been proven thus far to increase the prevention of certain ailments that could destroy quality of life, as well as potentially treat and cure others.